Connecting your Apple to your home network is as easy as plugging the Uthernet/Uthernet II or the LANceGS card into the Apple, and then plugging a Cat-5 Ethernet cable from the card into your home router or switch. You just need to set ADTPro's IP parameters (details below). 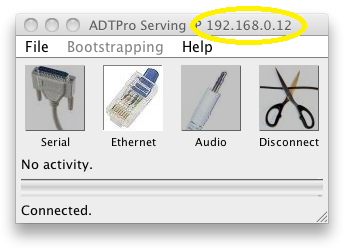 ADTPro will automatically detect which kind of Ethernet card you have, as well as the slot it is in. It will ask for network parameters from DHCP by default, or you can set them explicitly yourself. If your local network has MAC address filtering, you may need to add a rule for your router to allow the Apple to join the network. The MAC address assigned to an Uthernet card by ADTPro is 00:80:10:6d:76:30. The MAC address assigned to a LANceGS card by ADTPro is 00:80:0f:10:18:67. 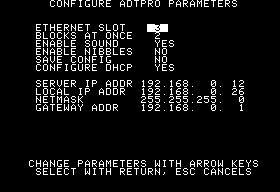 The ProDOS Ethernet version of the ADTPro client program is named ADTPROETH on the ADTPro-2.0.3.dsk disk. Ways of making ADTPROETH start automatically are discussed here. The SOS version of the Ethernet ADTPro client program is named SOS.INTERPETH on the ADTProSOS-2.0.3.dsk disk. It will be necessary to rename SOS.INTERPETH to SOS.INTERP (also deleting or renaming the original serial SOS.INTERP program) in order to run it. Additional details about starting the client on SOS are here. You can scroll between the selections with the up and down arrow keys. If your Apple doesn't have up and down arrow keys, the space bar will cycle between the selections. You can rotate through the options of a particular selection with the right and left arrow keys. Your Apple has right and left arrow keys; trust me. Select the slot your Ethernet card is in. The most common slot is 3, but it could be any slot from 1 to 7 (1 to 4 in Apple /// computers). ADTPro will scan the slots to guess where it is for you. But if you have multiple Ethernet cards in your system, you will need to choose which one to talk to. Pull off your Apple's lid to check if you need to. If you have a IIgs, ensure you select "Your Card" in the IIgs' control panel for the slot your Ethernet card is in, and select that same slot number here. Blocks at Once tunes the number of 512-byte blocks to send "at once" within a transmission packet. A higher number will make disk transfers go faster, but will offer less immediate feedback as you watch the progress bar move. The sound option is, of course, up to you. ADTPro makes bleating sounds when things finish or abort. I personally think computers should be seen and not heard, but not everyone feels that way. Express your own personal feelings here. ADTPro can make basic nibble copies of 5-1/4" disks. This might be useful for making a working copy of a very lightly copy-protected disk, or if you are working on de-protecting a disk. Setting this option to "YES" will present you with the option to send either a normal or nibble image when sending a 5-1/4" disk. This option is not available on the SOS version of ADTPro. Hit the "Return" key any time to work with the parameters on-screen. Once you get a configuration that works for you, select "YES" for SAVE CONFIG and hit Return. This will save a configuration file, ADTPROETH.CONF, to the same place where you started ADTPro from. When you start ADTPro again, it will use the configuration parameters you saved last. You can either get your local IP address and other configuration elements from your network's DHCP server, or you can enter them manually. Leave "CONFIGURE DHCP" set to "YES" to request a DHCP configuration if you don't already have one assigned. If, instead, you'd rather manage all the parameters yourself - simply set "CONFIGURE DHCP" to "NO" and configure away. Note that in all cases, you will still need to manually enter the server's IP address (see below). When editing the IP address numbers, you can't backspace - the left arrow moves you to the field to the left. So, if you make a mistake, just hit the left and right arrows so you can start over again with that number. Play with the screen for a minute and you'll get the hang of it. The rest of the parameters will be filled in for you automatically if you keep the default CONFIGURE DHCP setting of YES. If you would rather fill them in yourself, the following paragraphs will go over that. For LOCAL IP ADDR, enter any IP address on your subnet that isn't already taken. The final suffix of .123 is as likely a candidate as any to work. For NETMASK and GATEWAY ADDR, these will be the same for the server computer as for your Apple, assuming you're on the same network. If the server is running Windows, you can find this information by issuing the command: ipconfig /all from the command line. If the server is running Linux or OSX, you can generally find it with the command: ifconfig en0 or ifconfig eth0 from a terminal window. The graphical network configuration program for your operating system will have all the details you need, but you may have to do some digging to get at them. Chances are, though, that if you bought one of these cards... you know these kinds of details. Feel free to ask for help if you need it. That will reset everything to defaults and you should be able to bring up the configuration screen, make corrections, then re-save it.